Featuring new P-90 PRO single coil pickups plus 6-position rotary VariTone. 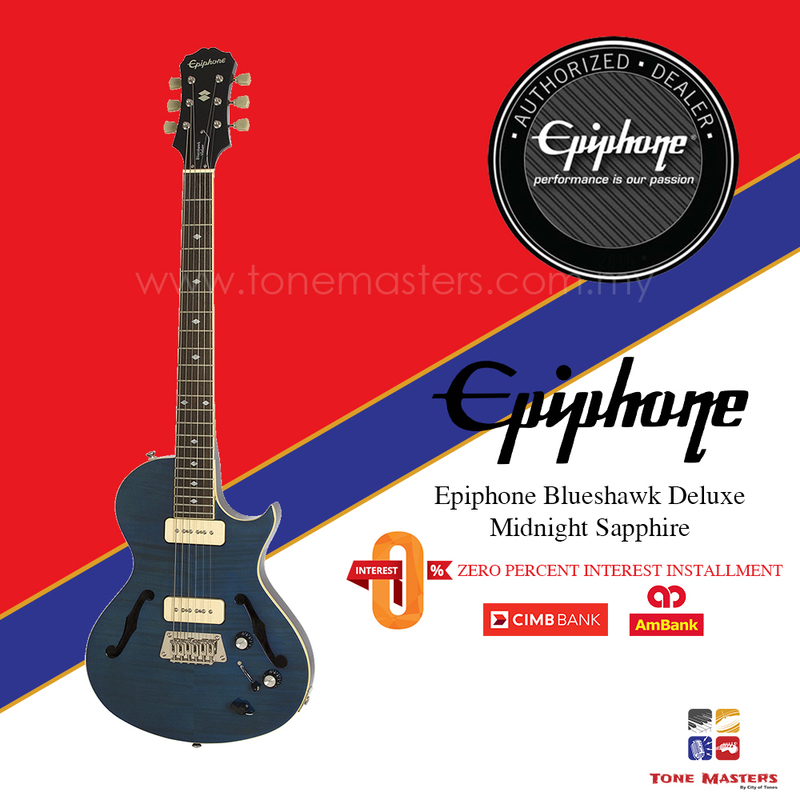 Epiphone presents the new Blueshawk Deluxe, the long awaited return of an original classic first introduced in the 90s that' been a connoisseur' favorite ever since. The Blueshawk Deluxe features the upper bout curve and cutaway of a Les Paul but with the semi-hollowbody design and small f-holes of an archtop. The result is one of the most versatile and distinctive guitars anywhere. 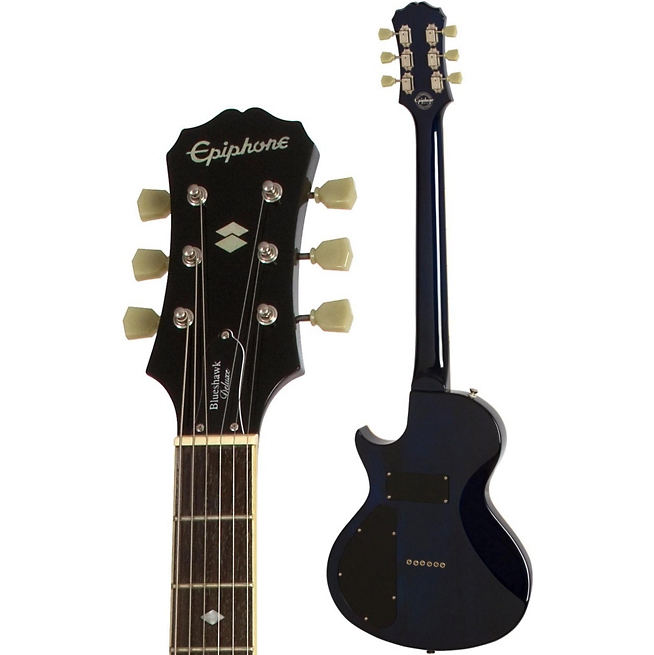 And now the Epiphone Blueshawk Deluxe features new P-90 PRO Single Coil pickups plus a 6-position Rotary VariTone. The Epiphone Blueshawk Deluxe features a Mahogany body with a contoured back and a Maple top with a AAA Flame Maple Veneer. 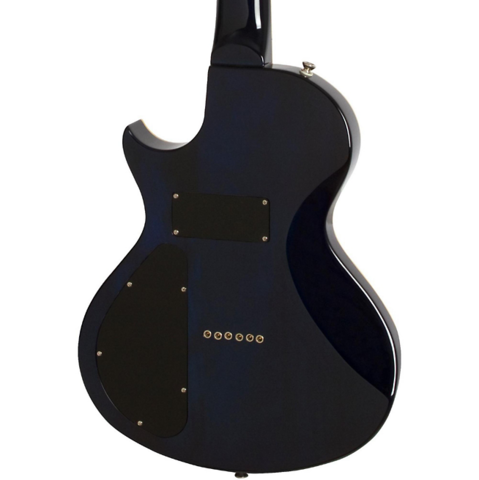 Both the body and the neck feature single-ply cream binding. The Blueshawk comes in three beautiful color finishes”Midnight Sapphire, Translucent Black, and Wine Red. The Mahogany neck has a classic Epiphone SlimTaper D-shape profile with a 25.5 scale. The Blueshawk Deluxe has a smooth Rosewood fretboard with pearloid œDiamond inlays, a 12 radius, and 22 medium jumbo frets. The f-holes and semi-hollowbody construction along with the œLes Paul style cutaway make the Blueshawk Deluxe well balanced and easy to play with exceptional tone and range for chords and leads. 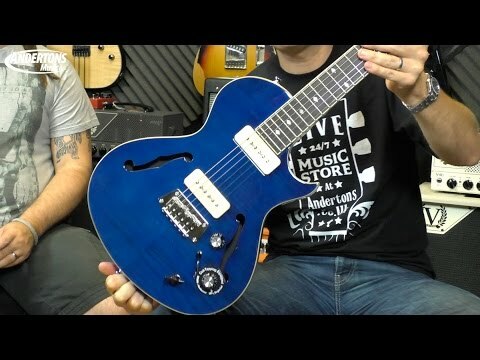 The Epiphone Blueshawk Deluxe features new P-90 PRO single coil pickups. The P-90 PROs follow in the footsteps of the critically acclaimed ProBucker humbuckers and both are part of Epiphone' PRO series featuring old style construction materials for boutique sound that anyone can afford. The Blueshawk Deluxe features a P-90R PRO Single Coil in the neck position and a P-90T PRO Single Coil in the lead position. Inside the body, there' a hum-cancelling "dummy" coil mounted between the pickups to provide hum reduction when the neck or bridge pickups are used alone. The pickups are controlled by the now classic Blueshawk 3-position pickup selector slide. Epiphone P-90 PRO single coil pickups have been designed and tooled from the ground up with new bobbins manufactured to historic dimensions, Elektrisola magnet wire, sand cast Alnico V magnets, and pole shoes manufactured using correct alloys to original classic Gibson dimensions. And for you sticklers to detail, the new Epiphone P-90 PROs also have tin plated brass base plates like those used on '50s and '60s era Gibson P-90 pickups. Along with exceptional power, the Blueshawk Deluxe also offers one-of-a-kind tonal flexibility. 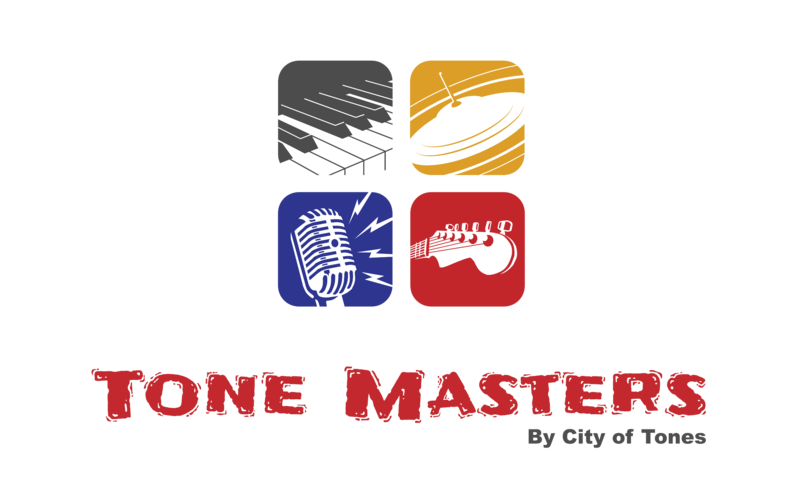 The 6-position Rotary VariTone provides a player with a wide tonal palette unavailable on most other instruments. The Varitone circuit is a "notch" filter that uses a range of capacitors to achieve a reduction in frequencies at set points within the BluesHawk's overall frequency spectrum. As the VariTone control is rotated from position 1 to position 6 the center frequency of the filter shifts from higher to lower frequencies. In position 1 the filter is removed from the circuit. Controls include a Master Volume and a Master Tone with an easy to access Push/Pull VariTone True Bypass.The Epiphone Blueshawk Deluxe features a fully-adjustable Epiphone nickel bridge with a string-thru body design for incredible sustain. Tuning and intonation is made easy thanks to Epiphone Deluxe machine heads with a pro quality 18:1 tuning ratio. An optional hard case is also available.